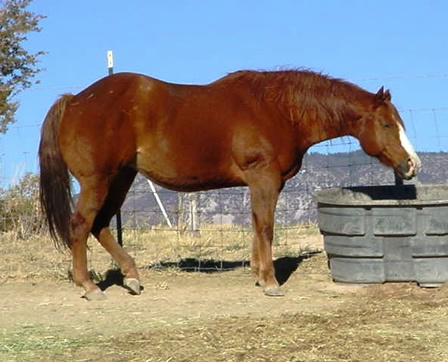 Unequaled Cassix - APHA - Sorrel Breedingstock - This is a great mare - super heavy muscled, a result of our line breeding of Showdown At Six. 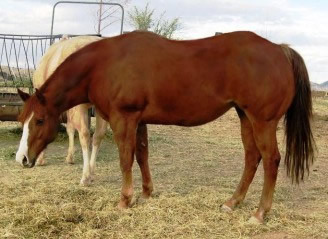 She is by Unequaled (deceased) APHA Superior Halter Stallion, by Showdown At Six and Sudsy Roulette, Superior Halter Mare. Her dam is by the World Champion,"Cluition" by "Obvious Conclusion". and her dam was Showdowns Classic, Congress winner and fourth in the World in 3yr. old Mares. She is the dam of Qualified, Showdowns Criquet, and My Dot Com.